Expert Glenn Drowns offers all the information and guidance you need to successfully exhibit your poultry at fairs and expositions. Learn how to select the best breeds and birds for exhibition and how to raise them with the proper diet, health care, and handling so that they are at their best by showtime. Drowns includes a useful "countdown" to help you plan tasks. From pest prevention to cage training, as well as dozens of tips on what judges are looking for. So you've fallen in love with raising chickens (or ducks or geese or turkeys), and now you can't wait to see how your beautiful birds compare with others. Preparing for a show, large or small, is a great way to practice proper handling and learn how to keep poultry healthy and thriving so they look their best. Author and veteran poultry judge Glenn Drowns will lead you through the entire process, from where to get your birds to what to expect from the judges. 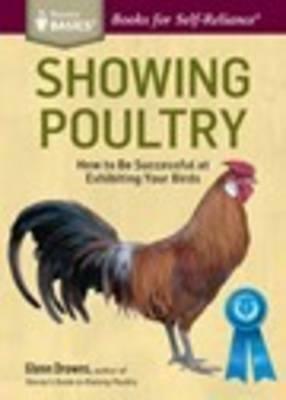 Glenn Drowns, author of Showing Poultry and Storey's Guide to Raising Poultry, 4th Edition, and his wife conserve and promote rare breeds and varieties of turkeys, ducks, geese, and chickens at their Sand Hill Preservation Center in Calamus, Iowa. Drowns, a highly respected poultry judge, has raised standard turkey varieties since 1989, and he received the American Livestock Breeds Conservancy's Breed Conservation Award in 1999 for his contributions to the identification and survival of rare turkeys.